Family-style dining has its share of benefits and drawbacks. Family-style dining, also known as casual-style dining in the United States, offers moderately priced entrees from menus featuring a mix of classic cuisines, and often individualized with signature sauces, dips, or other toppings. Family-style dining can be any number of themes, from barbecue (LongHorn Steakhouse) to Americana (Ruby Tuesday) to Tex-Mex (On the Border). Family-style restaurants offer tableside service and nondisposable dishes, while still keeping the menu moderately priced. The ambiance of a family-style restaurant can be comfortable and inviting. Although some family-style restaurants offer a limited alcohol selection, focusing on beer and wine rather than hard liquors, oftentimes this requires a different (and less costly) type of liquor license. Applebee’s Neighborhood Grill and Bar: As the name implies, their menu focuses on classic American food, including their signature menu item, Riblets. Olive Garden: Family-style dining at this restaurant chain helped Tuscan-style cooking go mainstream. On the Border Mexican Grill and Cantina: It is essentially the Tex-Mex version of Applebee's, featuring tableside service where servers whip up fresh guacamole for customers. LongHorn Steakhouse: Focuses on grilled entrees, including beef, chicken, and seafood. In traditional family-style dining, food is served on platters, and diners serve themselves (just like at home). You can see this type of dining at many traditional Chinese and Korean restaurants. Olive Garden built one of the most successful campaigns on their family-style dining with the tagline “When you’re here, you’re family,” serving up unlimited breadsticks and salad in large platters for the entire dining party. 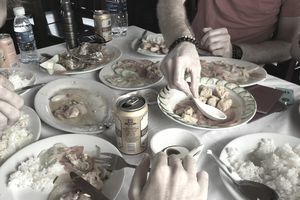 Today, it is not uncommon for family-style restaurants to serve guests individual entrees already plated. If you offer catering services at your restaurant, family-style dining works well for small to mid-sized groups. It is much easier to simultaneously feed 50 people if you have to drop only 10 salads versus 50. Like every type of restaurant concept, family dining has its benefits and drawbacks. Large platters of food can be messy and there is little portion control, unlike when plating meals individually. Family-style dining also requires a group consensus of what to order, which can be challenging. Benefits of family style include a relaxed atmosphere where customers have more control over what they eat. If done right, family-style menus can have better food cost than a traditional menu. It caters well to families with children or groups of friends. Finally, family style, which has seen a resurgence at trendy restaurants throughout the country, offers a change from all the small plates that have been popular for the past few years. No matter what type of concept you decide to try, the basics of any successful restaurant are still great food, great people, and great service.